Martabak - a popular snack in some places, including my home country, Indonesia - is actually easy to prepare. 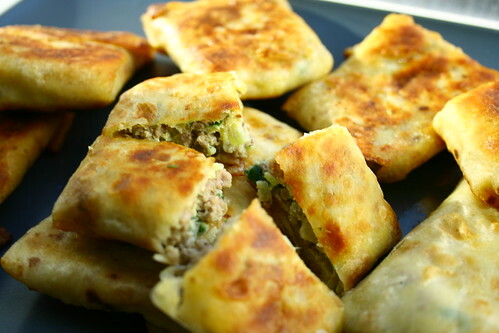 Basically it is just crepe (but potentially with many eggs for the batter), stuffed with vegetables and (if you wish) minced meat, deep fried for 3 minutes. Typically it is served with a dipping sauce that is a combination of shallots, chili pepper, palm sugar, soy bean, vinegar, and often cucumber slices. Lovely, Makes me wonder if day last more than 24 hours in Norway !! /me drools. Oh that looks good. Wow ... looking yummy. This is my favorite.